Bermane Stiverne, at 254 pounds, will have a big weight advantage over Deontay Wilder, 220 – but will it help him? As fans may have seen, the weights are in for tomorrow’s return meeting between Deontay Wilder and Bermane Stiverne. WBC heavyweight ruler Wilder came in at 220 pounds, which is about normal for him, but Stiverne raised plenty of eyebrows by tipping in at a hefty 254. Stiverne, 25-2-1(21) is a big guy, and he may well have packed on the pounds in an effort to be able to pack more of a wallop, but some people are wondering if the former champ is in top shape, if he’s trained as hard as possible. 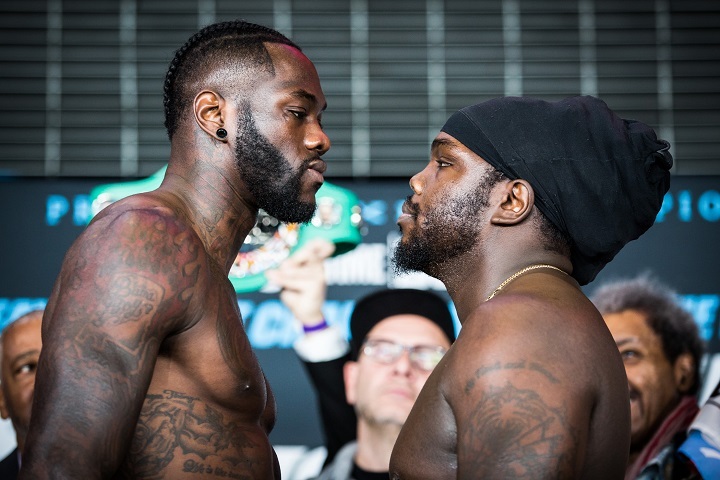 In comparison to the first fight – held in January of 2015 when Stiverne was the champ and Wilder the challenger – Stiverne weighed-in at a substantially lighter 239. Both men have exchanged plenty of nasty words ahead of tomorrow’s rematch in New York, with both warriors coming out with distasteful remarks concerning death and their intention to actually killing one another. With genuine bad blood attached, Wilder-Stiverne II might pull in a pretty big crowd as well as TV audience. Wilder is a huge favourite to repeat his 2015 win, but many fans are expecting “The Bronze Bomber” to score the KO this time instead of allowing the older (Stiverne is 39, Wilder 32), terribly inactive challenger to stick around to hear the final bell. Wilder, 38-0(37) is of course looking ahead, if not looking past Stiverne, towards a huge heavyweight unification battle with WBA and IBF champ Anthony Joshua. This match-up, one we all want to see, could be the biggest heavyweight title fight in some years. But can Stiverne spoil the party and derail Wilder? Stiverne is talking a great fight and he is of course durable and tough; being the sole pro fighter to have taken Wilder the distance. But how long, and how effectively can Stiverne carry those 254 pounds? Prediction: a far better fight than many are expecting breaks out, with an aggressive Stiverne having his moments of success, maybe even wobbling Wilder, before the older, heavier and slower man runs out of gas. At this juncture Wilder will show no mercy and will stop Stiverne, either with the white towel being thrown in or with the referee diving in. Look for Wilder to get the job done in around seven or eight rounds. You are here: Home / Boxing News / Bermane Stiverne, at 254 pounds, will have a big weight advantage over Deontay Wilder, 220 – but will it help him?